Here's my card for the current Lawnscaping one layer card challenge. I used one stamp set along with some masking and markers to add depth to the simple design. 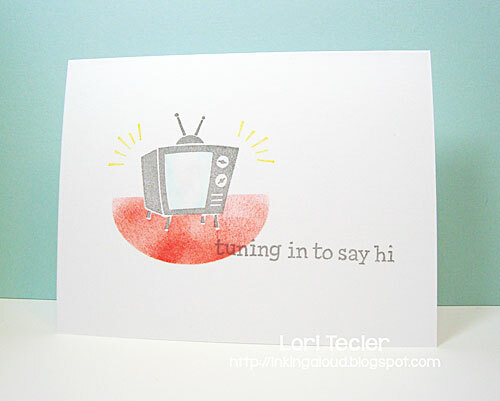 I stamped the TV from Lawn Fawn's Stay Tuned set in gray ink on a white card base. The screen is shaded a bit with Copic markers. I really wanted to add some Glossy Accents to it for a glass-like look, but I stuck to the true one layer challenge! After masking the stamped image with a sticky note, I used a sponge and a half-oval reverse mask to add a red "rug" under the TV to ground it. To add a bit more color, I used yellow ink to stamp some lines around the TV, then added the sentiment across the card in gray ink. Great card Lori! I have owned this Lawn Fawn set for about two years now and it's one of my favorite go-to stamp sets for making masculine cards!